Kwantlen Polytechnic University business and criminology professor Ari Goelman’s second novel, The Innocence Treatment, is the latest to be featured as part of the annual KPU Reads series. The book, which hit shelves in October, is a work of young adult dystopian science fiction that explores themes of paranoia, lies, and critical thought. 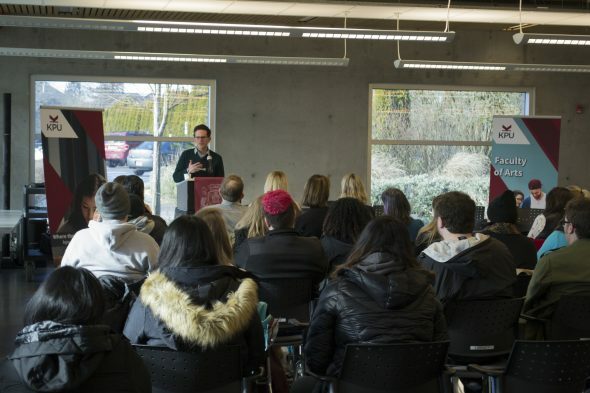 In an event on the KPU surrey campus library, Goelman read from his book and took questions from students on Jan. 22. The Innocence Treatment is set in the near future and follows Lauren, a 16-year-old girl born with an extremely rare cognitive disability that inhibits critical thinking. Her condition makes it impossible for her to tell when people are joking or lying, so she believes that everyone she meets is her friend and that everyone has good intentions. As the story opens, Lauren is about to undergo an experimental surgery to correct the disability and give her a chance to live normally. The novel reads as a series of journal entries and interview transcripts from various time periods before and after the procedure. Its back-and-forth structure highlights Lauren’s transformation from a naive and carefree girl to an extremely paranoid individual dismayed by the dystopian world in which she lives. “Some of the fun of the book—as you go back and forth between her journal entries and you see her grow much more cynical and much more knowing about the world, and then you see her maybe veer into paranoia—is trying to figure out how much is paranoia and how much is the dystopian world,” says Goelman. While he says that he’s not trying to make any sort of political statement with the book, Goelman acknowledges that some of the themes of The Innocence Treatment are highly relevant today. Its exploration of dystopian society takes on a deeper meaning now, when propaganda and public deception are pervasive parts of popular discourse.